The P3 Power Boost » Get a Clean Start! Believe it or not many women are not properly cleansing their faces. With so many products on the market it may be hard to choose. I’ve been through many products before I found the right one for me. 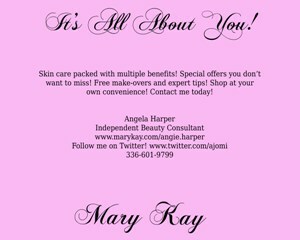 I am a Mark Kay consultant and due to the changes in my skin and in the products of Mary Kay, I am able to use their brand of facial cleanser. Does this mean each of you should rush out and buy Mary Kay 3 in 1 cleanser? No way! When it comes to skin care the phrase, “What’s good for the goose is good for the gander,” is null and void. Take time to figure out what kind of skin you have. Make note of anything that irritates your skin; food, drink, make-up, or cleanser and be sure to avoid it! Also, make note of any facial products that don’t do anything for your skin. I tried a cleanser that did absolutely nothing for me; face wasn’t cleaner, breakouts still occurred, and I was dissatisfied. Once you’ve found a brand that works for you, buy the products that you need for your skin type. You should cleanse your face at least 2x per day. If you are more active, like I am, you will have to clean at least 3x per day. Be sure not to use an abrasive cloth or scrub too hard; be gentle with your skin! If your cleanser doesn’t have a sun screen in it, use an odorless sun screen to protect your skin. Throughout the day avoid touching your face. Yes, it’s not an easy thing to do, but try hard! Our hands cradle lots of germs, so let’s not put those germs on our faces. Whatever make-up you have chosen to wear throughout your day should be cleansed off before you go to bed. I am guilty of not doing this and I pay for it with itchy eyes in the morning. No fun! Even if you don’t do your full beauty regiment, at least remove your eye make-up. Your face cleaning process has to be a part of your routine! We all have an order as to which we get ready for work, school, going out, etc. Put your skin care into your routine and don’t slack off! Most skin care sets recommend a weekly facial mask. Put some pizzazz in your routine and when you mask, give yourself a home pedicure or manicure. You’ll have a spa treatment without a spa price! Remember, an artist would never use a dirty canvas to paint a master piece, so why would a lady put on her make-up without properly cleansing her face? Take care of your skin ladies!